-Share this Raffle trough journal/status/poll! Raffle end in 3 days or more, so quickly join now!!. You can't trade, resell, gift after you win. MY brah ty for advertising this bab even tho its already closed much salute !!!!!!!!!!!! Reply here to join! but don't forgot to follow the rule! ON TIMEE !! GOOD LUCK XDD #47 !! Watching already, faved everything and shared in a poll!! you got ticket number #41 42!! Watched, Faved deviation and journal, shared journal. And heres the comment!! I only knew of this because my friend joined, but I’m glad that I found this! He’s gorgeous! aww thank u that sweet of you!! Aaaaand commenting! Good luck to everyone! you got ticket number #36 and 37! you got ticket number #34 and 35! yay 030!!!! will you be putting the persons name up who wins after the raffle ends? Ah!!!! You totally deserve it!!! GL to everyone taking part and sending you all the love Aro!! 200 Watchers Raffle!! 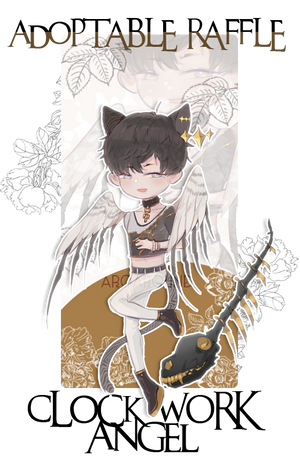 (CLOSED)200 Watchers Raffle! * Be a watcher, new watchers are always welcome!~ However if you unwatch me after the prize, you are blocked immediately, this is for supporters and those who are willing to support my artwork. VALENTINES RAFFLE [WINNERS ANNOUNCED]UPDATE 3: HAPPY VALENTINES EVERYONE THANK YOU ALL FOR JOINING. WINNERS ARE TAGGED IN THE FEATURED COMMENT BELOW, CONGRATS !! please refer to my commission journal for dos/donts as i can’t draw everything! 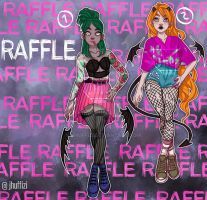 UPDATE 2: RAFFLE IS NOW CLOSED TY FOR JOINING!! TICKETS ARE CURRENTLY BEING DISTRIBUTED. WINNERS WILL BE ANNOUNCED SOON! there will now be 2 winners !! From now on the raffle is closed and soon I will announce the winners.